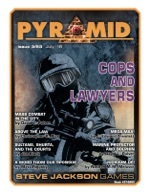 The forces of law and order make your campaign come alive, thanks to Pyramid #3/93: Cops and Lawyers. This issue looks at various agents of the legal system and the police forces tasked to ensure peace. Play out tactical encounters between police and criminal groups using GURPS Mass Combat; pilot two common U.S. Coast Guard vehicles (with GURPS stats); and look at how the legal system might adapt in GURPS Supers or GURPS Psionic Powers. This issue also ventures beyond the modern day, with a guide to the legal system of the classical Islamic world, plus an exploration of trials by combat and ordeal . . . including what might happen in realms where gods really do interfere. And there's still more in this issue – check out another vignette set in the new Car Wars universe! Your day in court begins with Pyramid #3/93: Cops and Lawyers! Pick it up individually or subscribe today for this and many more months of gaming excitement.